Cook the onion and peppers over low heat for 10 minutes in a non-stick frying pan with 3 tablespoons of olive oil and a pinch of salt. Place the onion and peppers into a baking dish. Preheat oven to 350 degrees F (175 ºC). 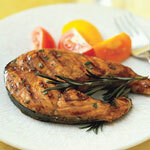 Place the salmon fillets into the same baking dish and season with salt and freshly ground black pepper. Serve and enjoy your baked salmon.